Rosberg's front wing was trapped under his car after crash, meaning he was easily passed by HamiltonThere will be controversy at Mercedes about the move that decided the race.World champion Hamilton was on the outside and alongside heading into Turn Two but his German team-mate held him out wide, delaying his turn-in, and they collided as Hamilton tried to turn in.He was pushed off the track but the collision had damaged Rosberg's front wing, which sparked along the track as Hamilton passed the German, who then lost further places to Red Bull's Max Verstappen and Ferrari's Kimi Raikkonen. Hamilton told his engineer over team radio: "I was on the outside - it wasn't me who crashed. "What was said afterwards?After having to endure a round of booing from the mainly German-Austrian crowd, Hamilton added on the podium: "He made a mistake into Turn One and I had an opportunity to go around the outside in Turn Two. I left a lot of room on the inside and I guess he locked up and crashed into me. "Rosberg - who was also given a reprimand for driving with a damaged car - had a different view, but BBC F1 analyst Allan McNish said any blame for the collision was in Rosberg's court. "Absolutely gutted," said Rosberg. "We were battling and I was struggling a little with my brakes. I went a bit deep but that is fine because I am on the inside so I can dictate. So I was surprised Lewis turned in and caused a collision. It's unbelievable. 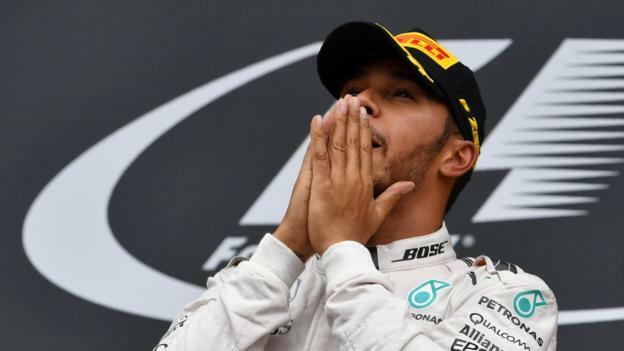 "Listen as crowd boo Hamilton during podium interviewsMercedes said Rosberg had had a brake-by-wire failure - which affects the rear axle - at the end of the penultimate lap.But team boss Toto Wolff still described the collision as "brainless" initially, without saying who he felt was at fault.How did they end up like that? 89% of those who voted in our live text commentary poll said Nico Rosberg was to blame for the collisionThe win will be a relief to Hamilton, who might have thought pit errors and questionable strategy could cost him.The world champion will also want to know how he ended up behind Rosberg in the first place, having started from pole and led the first 21 laps of the race as the second Mercedes fought up from sixth.Hamilton took a brilliant pole position in the damp conditions on Saturday, beating Rosberg by more than half a second and was looking good for a win with his team-mate demoted to sixth on the grid because of a gearbox penalty.Hamilton led comfortably in the early stages of the race as Rosberg fought past Force India's Nico Hulkenberg and McLaren's Jenson Button to be running third behind Hamilton and Ferrari's Kimi Raikkonen by lap 10.His engineer then decided to bring him in for his first pit stop, fitting the most durable soft tyres, while Hamilton stayed out on the more fragile ultra-softs at the front.Although Hamilton was easily able to stay clear of Raikkonen, this enabled Rosberg to close on Hamilton so he was 21 seconds behind - and in fourth place behind Raikkonen and his team-mate Sebastian Vettel - when Hamilton made his first stop on lap 21.That should have been just enough to ensure Hamilton retained the lead, but he was delayed in the pits by a problem with his left rear wheel and he rejoined behind Rosberg. Hamilton takes his first win in Austria. Alain Prost has the most, with three. Source: ForixAfter a mid-race safety car, it at first appeared as if Rosberg might be on a two-stop strategy and Hamilton only one - and Mercedes said that was indeed the initial plan.But Mercedes realised the one-stop would not work for Hamilton so in the end both stopped for tyres within a lap of each other, Hamilton first on lap 54.Hamilton was fitted with used soft tyres, while Rosberg was on new super-softs, a set of which the world champion did not have.Hamilton questioned the decision but was told by Bonnington he felt they were the best available tyres. He was proved right, leading to the dramatic climax.